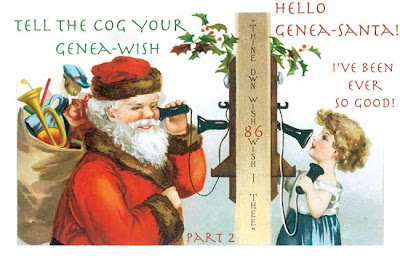 Holiday Edition of The COG Part 1 & 2 Ho! Ho! Ho! over shadowed by the Christmas/Hanukkah/New Year holidays. and ancestors this time around. and/or anniversaries on your family tree. 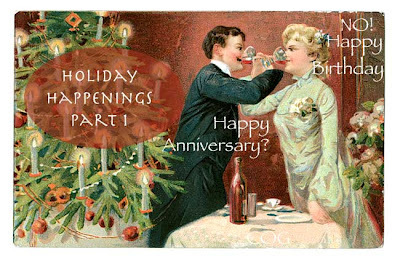 and write a toast to the anniversary couples. Share it in the COG! And this edition will have a Part 2 as well (separate blog post)! Please use a descriptive phrase in the title of any articles you plan to submit and/or write a brief description/introduction to your articles in the "comment" box of the blogcarnival submission form. This will give readers an idea of what you've written about and hopefully interest them in clicking on your link. Introductions for your articles will not be provided for you due to the volume of articles submitted. Thank you! Also, check out Jasia's post "FAQs About The Carnival of Genealogy," for all you need to know about submitting a post. First-timers always welcome and greatly appreciated! Submit your blog article to the next edition of the Carnival of Genealogy using the carnival submission form or select the 86th Edition COG poster in the upper right hand corner of this page. Past posts and future hosts can be found on the blog carnival index page. How Do I Love The COG?